SEATTLE (AP) Even without injured stars Adrian Beltre and Elvis Andrus, catcher Robinson Chirinos still sees plenty of potential in the Texas Rangers’ lineup. Chirinos’ tiebreaking two-run double in the seventh inning capped another late-inning rally, and the Rangers beat Seattle 7-6 on Wednesday. The Rangers did damage in back-to-back games against a wild and ineffective Seattle bullpen which surrendered five runs in the sixth and seventh inning after ace left-hander James Paxton departed with a 4-2 lead. ”These guys continue to stay in the at-bat, grind them out and we were able to push across some runs,” Texas manager Jeff Banister said. Delino DeShields (walk) and Shin-Soo Choo (single) reached base for Texas to open the seventh against right-hander Ryan Cook. Two batters later, Nomar Mazara greeted left-hander Marc Rzepczynski with a sharp two-run single to center field to tie the game at 5-all. Rzepczynski walked Jurickson Profar and Joey Gallo before he was pulled without getting an out. Against Juan Nicasio, Seattle’s third pitcher of the inning, Chirinos lined a hit off Ryon Healy’s glove at first base, easily scoring the go-ahead runs. Rzepczynski (0-1) saw his ERA jump from 7.04 to 9.39. He has given up runs in three of his seven May appearances. A night after issuing eight walks in a 9-5 loss, Seattle pitching gave up seven walks Wednesday. It was the Rangers’ first back-to-back wins on the road since taking the first two games of a series in Toronto, April 27-28. Right-hander Tony Barnette (1-0) picked up his first win of the season in relief of Matt Moore. Keone Kela earned his 12th save, giving up an RBI single in the ninth to Nelson Cruz. Kela, who graduated from nearby Chief Sealth High School in Seattle, had registered four consecutive scoreless outings in the past week before Wednesday. He has become the team’s primary ninth-inning option. After the Mariners acquired left fielder Denard Span in a trade with Tampa Bay on Friday, Servais noted that outfielder Ben Gamel could see action at first base with Healy. Gamel played one game at first base last season. As the fourth outfielder, Gamel said he is willing to try anything to stay in the lineup. Rangers: To clear room for Moore on Wednesday, the team optioned Austin Bibens-Dirkx to Triple-A Round Rock. … Despite being 8 for 22 (.364) in his past five games and hitting a bases-clearing double in the ninth inning Tuesday, second baseman Rougned Odor was out of the starting lineup Wednesday. Banister said it was just a planned rest day. Mariners: After taking his second loss Tuesday, closer Edwin Diaz was unavailable to pitch Wednesday. He has pitched in six of the team’s past eight games. 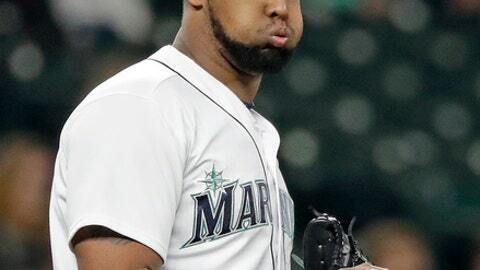 Recently acquired Alex Colome would have pitched in a save situation, Servais said. Mariners: Backup catcher Chris Herrmann tweaked his rib cage during batting practice Tuesday, and was placed on the 10-day DL an hour before first pitch Wednesday. David Freitas, who was in Triple-A Tacoma, was already with the team, just in case a move was made. . Right-hander Hisashi Iwakuma (shoulder) had his batting-practice throwing session delayed yet another day Wednesday with a stiff neck. Rangers: Left-hander Mike Minor (4-3, 5.63 ERA) has a team-high four wins. And even though he has had an awful May (2-2, 6.91 ERA this month), he won his last start in Kansas City on Friday. He has two no-decisions already against the Mariners this season. Mariners: Left-hander Wade LeBlanc (0-0, 2.70 ERA) has given up just five runs in 26 1/3 innings (1.71 ERA) in five starts. The most he’s given up in any start is two runs. This will be his first career start against Texas.